Did you know that Massachusetts, Minnesota, and New York have state muffins? If you did know that, I would be very surprised. Talking about weird state facts, the motto of Maryland is "Fatti maschil, Parole femine," which translates to manly deeds, womanly words. I have no idea it means. I like muffins because they are really cake that we have collectively decided is socially acceptable to eat at breakfast. Since it doesn't have icing, it can't be considered a dessert. Quick breads, like muffins, were not developed until the 18th century. Before the 18th century all breads were leavened with yeast. A chemical called pearlash was discovered in the US that allowed bakers to leaven chemically. 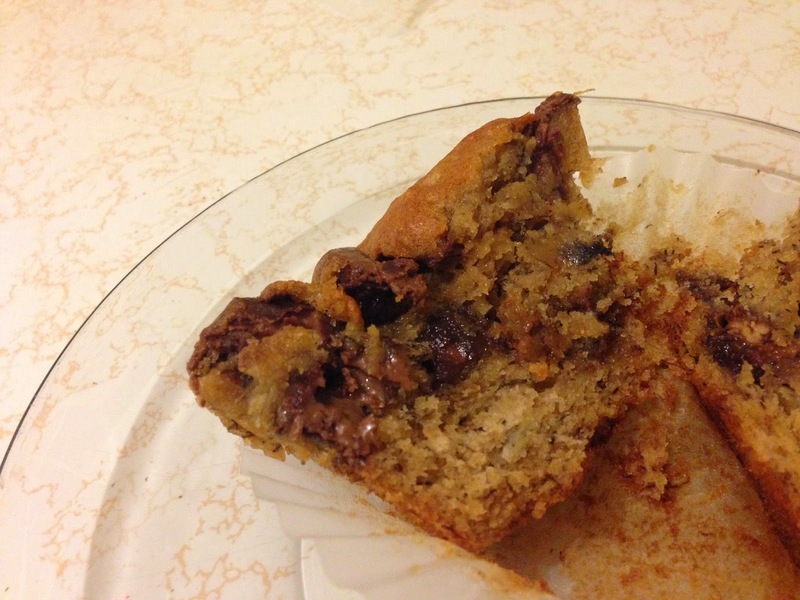 For these muffins, I used a recipe from Allrecipes and added peanut butter and peanut butter cups: two great additions! The ingredients are 1/2 cup peanut butter, 1 cup mini peanut butter cups, 1 1/2 cups all purpose flour, 1 teaspoon baking soda, 1 teaspoon baking powder, 1/2 teaspoon salt, 3 bananas, 3/4 cup white sugar, 1 egg, and 1/3 cup coconut oil. The recipe actually calls for a 1/3 cup melted butter instead of 1/3 cup of coconut oil. I began by adding the flour, baking powder, baking soda, and salt to a bowl. I stirred the dry ingredients together well. I mashed the bananas with a fork. I added the sugar, melted coconut oil, egg and peanut butter into another bowl. I mixed all the wet ingredients together. I poured the liquid mixture into the flour mixture. I added the mini peanut butter cups. I have heard that the key to a perfect muffin is to mix as little as possible. It's okay if there are a few little lumps of flour. The batter looks a little lump anyway because of the mashed bananas. I scooped my batter into some jumbo muffin cups because bigger is always better. I like a hearty muffin. The batter came to about a half an inch from the top of the liner. I baked the muffins for 25 minutes at 350 degrees. It wasn't enough time. The center of the muffin was a little doughy. I should have baked it for at least 5 more minutes. Despite being a little undercooked, it was delicious. 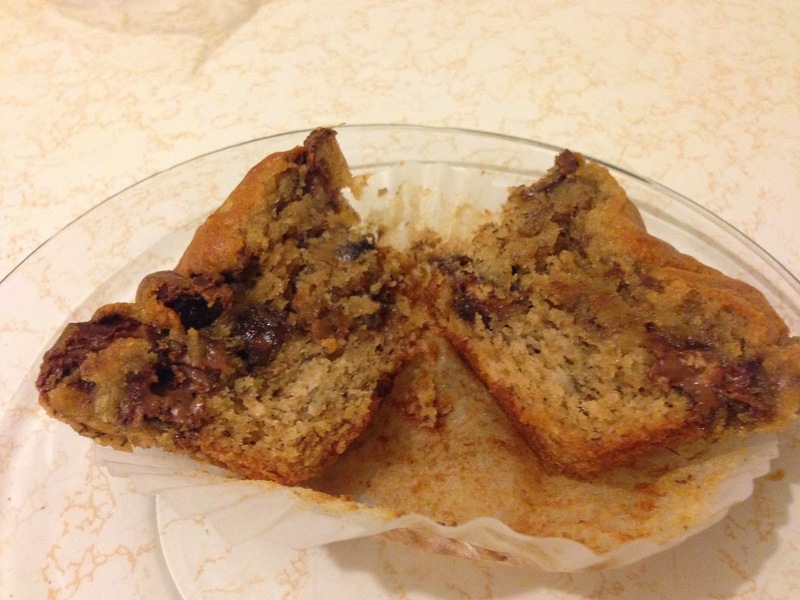 This is one of four muffin recipes I have made for my blog. The chocolate blueberry muffins and carrot, coconut, and pineapple muffins were both standouts, but this little gem is pretty tasty. Chocolate, peanut butter, and bananas are a match made in heaven. The bananas and peanut butter keep the muffins nice and moist too. I froze a few to eat later, and they were fresh and soft when I defrosted them. 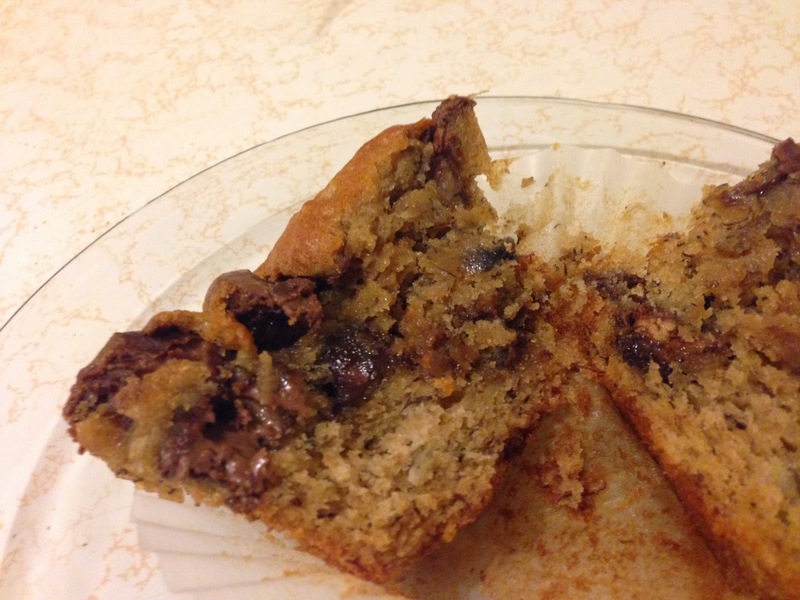 The peanut butter cups make these muffins especially decadent.